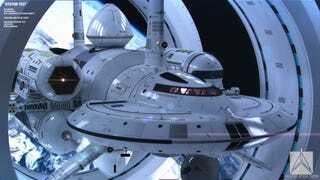 Holy Crap, NASA's Interstellar Spaceship Concept Is Amazing! You're looking at NASA's interstellar spaceship concept—the IXS Enterprise (not a joke, that's the name.) Developed by NASA's Advanced Propulsion Lead Dr. Harold "Sonny" White and concept artist Mark Rademaker, this ship would use a warp drive to travel faster than light without breaking general relativity.